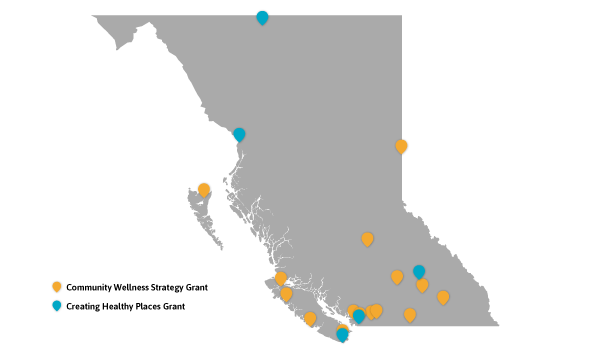 More local governments in BC will now be able to embark on projects to improve community health and well-being for their constituents, thanks to $125,000 in new grants and additional customized supports recently awarded by PlanH, a partnership of BC Healthy Communities Society and the Ministry of Health. Building healthy communities involves the incorporation of health and equity into policy and planning, creating the conditions for better health and well-being for all community members. Two new streams of PlanH grants were offered to aid in different aspects of Healthy Communities work: the Creating Healthy Places Grant, which supports communities in planning and building healthy environments, and the Community Wellness Strategy Grant, which supports local governments and their partners in developing new strategies or policies to improve health and well-being. Unlike most funding programs, PlanH grants award not only financial support, but also consulting support from BC Healthy Communities staff, who will provide these communities with process, planning, policy and partnership assistance to help ensure their project is a success. “The funding portion of these grants is a great foundation, but what really makes the PlanH program innovative are the customized supports we’re able to offer each community, so that their efforts can have maximum impact on health and well-being,” says Victoria Barr, Program Manager at BC Healthy Communities, which delivers PlanH in partnership with the Ministry of Health. The PlanH program offers supports to health authorities and other partners to create healthier communities across the province, supporting partnerships across sectors, facilitating collaborative local action, and providing learning opportunities, resources and consultation. PlanH helps to foster strong relationships among health authorities, local governments and other community partners. PlanH grants and supports are designed to target communities at various levels of engagement with health authorities, with the dual aims of strengthening those relationships and helping communities to address issues using a Healthy Communities approach. For more information on resources and upcoming funding opportunities to support your community in planning for health, sign up for our PlanH eNews or explore our website at PlanH.ca.